Do Not Waver…His Promise is Sure! I saw a vision of people setting out in faith on journeys that were connected with a promise of God given to them. They went out fully connected with the promise. Then I saw these same people in the midst of a stormy sea and the waves were fiercely crashing against the boat that they were in. Fear began to set in causing them to forget the promise that God had given them regarding their destination. They began to only see the waves and regretted that they’d set out on their journey. As they “wavered” in their faith they became connected with the waves rather that connected with the promise. This wrong alignment began to toss not only the boat but the people. If this is you then you are not alone! This vision reminded me of a number different times that caused God’s people to experience fear, regret and wavering as they followed His promise. In Exodus 14 the Israelite’s came upon the Red Sea with Pharaoh’s army approaching from behind. Great fear set in followed by regret for embarking on the journey to freedom. 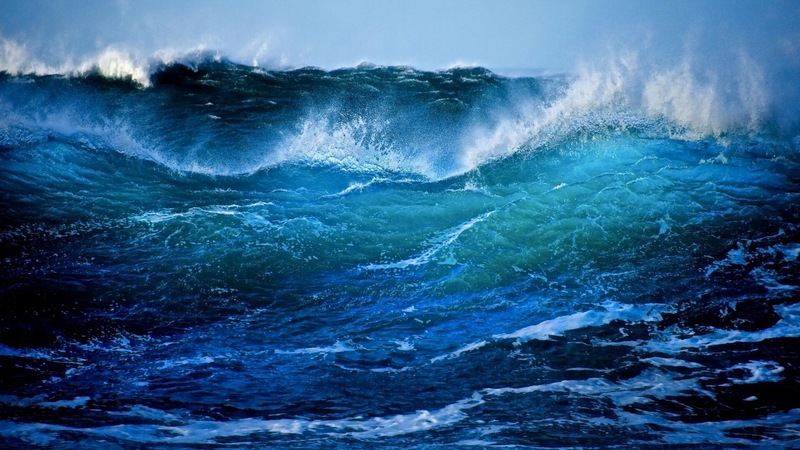 God promised deliverance but as the waves stood before them and a vast army approached behind them, fear and regret replaced the joy of the promise being fulfilled. In Genesis 32 God gave Jacob the promises of blessing and favor if he’d return to the land of his family. Jacob embarked on the journey with his family and people but as Esau (his brother) and his company of men approached, fear set in and he forgot the promise and began to devise a plan for survival, even wrestling with God for the blessing (although God had already promised His blessings). David, Job, Peter and so many more faced trials and waves on their journeys to see God’s promises fulfilled. It is important to remember that the battles that God’s people experience as they pursue His instructed steps and promises do not determine the outcome. They are merely shifting shadows being cast by enemy to deter you from completing your journey. The Lord’s promise is sure! We may face storms that seem to push us back but we must press on knowing that even the winds and waves obey His voice. My family and I have always sought to obey God’s steps and instructions. His steps have always been connected to His promises. In the midst of our many journeys there have always been times that we faced resistance, storms and obstacles to overcome. Seas stood before us and vast armies pursued behind us but God was with us. There have been moments of fear and even moments of regret as we wondered if we should have stayed in the “safety of the seen” rather than risked all by walking in the unseen. The fear and regret only proved to steal the joy in the journey. His promise always has been proven sure and true. The key is the promise! Do not let the waves redefine the promise with doubts or a back-up plan. Do not retreat or allow regret to determine your steps. Press on, for the promise is sure and the battles are won within the posture of alignment and connection with the promise. The Lord calls to you out of the place of victory. He calls you to come and obtain the promise. He provides wisdom, angelic help, supernatural provision and blessings as you press on. The battles are real but the victory is sure. Be courageous in the Lord for when you are weak His strength is made manifest. We are not a people who waver or who are pushed back. We are those who overcome. We are strong and courageous because we know who is with us. We will stand firm because the Lord of Hosts is leading the way to our sure victory. This is what the LORD says: Do not be afraid! Don’t be discouraged by this mighty army, for the battle is not yours, but God’s. Arise in faith and stand firm in the promise that has been given to you. Speak to the fear in your soul that connects you to the waves rather than the promise. Declare over your soul the words, “Be strong and courageous!” Declare over the waves the promise of the Lord. “For the vision is yet for the appointed time; It hastens toward the goal and it will not fail. Though it tarries, wait for it; For it will certainly come, it will not delay.